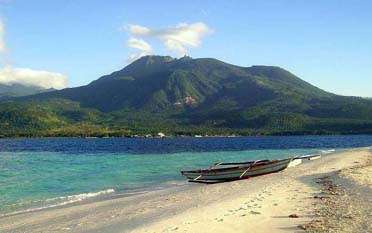 "Paradise Island of your Imagination"
CAMIGUIN is a small pear-shaped volcanic island with a total land area of 238 sq. kilometers in the north west coast of Mindanao. It lies 10 kilometers off the coast of the Province of Misamis Oriental. Along with the Provinces of Bukidnon, Lanao del Norte, Misamis Occidental and Misamis Oriental, CAMIGUIN forms part of a geopolitical grouping of provinces comprising Region X or Northern Mindanao. 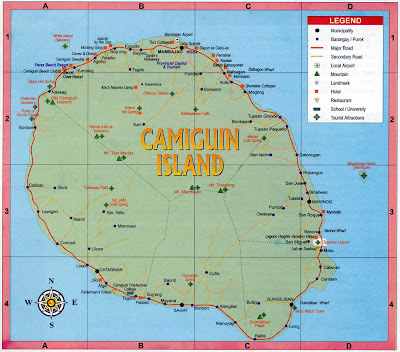 In terms of land area, CAMIGUIN is only around 2 percent of Region X.
CAMIGUIN ISLAND is said to be "Born of Fire". It has been known as a volcanic island since it has seven volcanoes unmatched anywhere else in Southeast Asia and one of the volcanoes there has been unpredictably active which is the Mt. Hibok-hibok. Volcanic eruptions and land movements have created this spectacular island full of natural wonders and historical riches. Mt Hibok-hibok plunged Camiguin’s old capital, Bombon, in 1871 and throttled almost 2000 inhabitants from its raging eruption in 1951. Since then, the volcano rested quietly giving its residents an assurance of normal living. And due to its volcanic wreckage from previous eruptions, most of Camiguin’s beaches are covered with pebbles and dark sand. 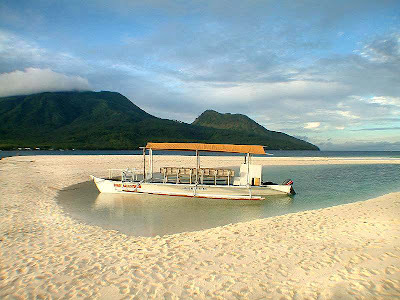 As an island of varied ecosystem, CAMIGUIN'S uniqueness lies in its various landscape, pristine natural environment and rural setting. 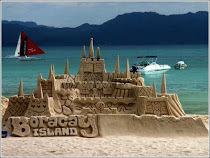 As a matter of fact, the Province has been identified by the Department of Tourism as one of the top 25 tourist destinations in the Philippines, and No. 7 diving spot in the world. It is a tiny island of luxuriant forests, volcanic grandeur, eternal hot and cold natural springs, pristine patches of black and white beaches, majestic waterfalls, exotic marine life, blue-ridge mountains, tranquil surroundings, idyllic lifestyle; it has a glorious past, and is inhabited with jovial people. The truth is, CAMIGUIN is best experienced than described as one gets enchanted by her mystical charm. It really has amazing natural resources and peaceful atmosphere that stir and baffle the minds of everyone. CAMIGUIN is believed to be one of the Philippines's most beautiful island - a virtual paradise - as the island allows visitors to experience a sample of untouched beauty in its entirety. CAMIGUIN generally has good weather with seasonal rain showers enhancing its fresh green environment. Fine weather is guaranteed from April to June, while the coolest is from November to January. Locked in the eternal embrace of the sea, CAMIGUIN continues its simple existence sheltered from and unfazed by the virulent pressures of today's accelerated lifestyles. These are the testimonials and bits and pieces of the eruption of Old Vulcan Daan in 1871 that wiped out the illustrious town of Catarman. It is a monument with thick century-old walls, belfry and convent which stand reminiscent of the second Spanish settlement established in 1697. 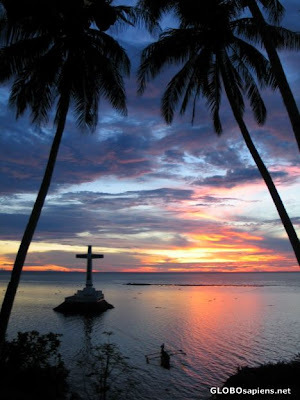 A large white cross marks a cemetery swept into the sea by Old Vulcan Daan's eruption in 1871. From here it is a perfect place to watch the wonderful sunset over the ocean. It is also an ideal place for snorkeling and diving. An annual fluvial procession is held by townsfolk in honor of the sunken graves of their forefathers and as a thanksgiving for a bountiful harvest. It is where life-size statues representing the passion, death, and resurrection of Jesus Christ - the 14 Stations of the Cross that dot a trail to Old Volcano's peak are found. At the last station is a tomb carefully carved and chiseled out of volcanic rocks. The pilgrims gather together here to pray during Lenten Season. A beautiful, clear stream of water cascading 70 meters into a rock pool surrounded by ground orchids, wild ferns, trees and boulders. Its cold water provides a refreshing summer splash to all vacationers. 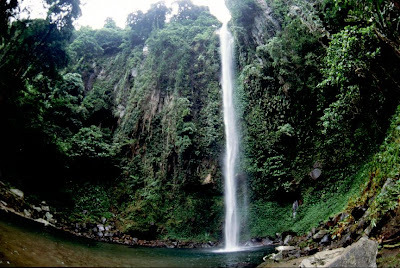 The approach to the wild and mighty falls entails a very scenic hike passing through the quaint Barrio of Mainit, Catarman and along the Rocky River bed. The pool below the deafening waterfalls is deep and clear. The surrounding scenery is virgin and perfect for a peaceful picnic. The only sound you hear is that of the tumbling falls and running water. It is 6 kilometers northwest of Catarman proper. 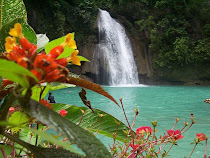 In Sagay is Binangawan Falls wherefrom several miniature and gigantic waterfalls gushing through majestic granite stones that converge in one main pool, covered with luscious unspoiled vegetation, and a mystical rainbow are arched by the fall's mist as the sunlight break in through it. In the heart of the island bubbles this mineral pool with water around 400C. Vapor rises from the heated waters that run down the vents of the dormant Hibok-Hibok volcano. The springs are ideal to bathe in at night surrounded by cool mountain air. It has therapeutic effects. Picnic huts and tables are available in the beautifully landscaped gardens and there is a restaurant on site. It is 6 kilometers southwest of Mambajao. It is a spring of natural cold and blue-green waters that overflow with grandeur, perfect to appease and quench one's humid feeling. It is situated at Tupsan Pequiño, Mahinog. A spring located 4 kilometers north uphill of Catarman proper. It has a terrific huge pool of cold spring water measuring 25m x 40m sprouting from sandy bottom. The area has native stores, picnic huts and toilets for visitors and guests. It is located 4 kilometers north of central Catarman. It is a volcanic hot spring not fully developed a little beneath sea level where a pool is formed by sea stones and corals. Water temperature shifts from cold to lukewarm to warm then to hot as tide changes. 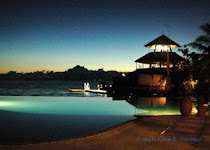 Submerge in the warm water inside the pool at low tide and enjoy the cold sea water merging with the hot spring. This rare spring is situated at Naasag, Mambajao - about 12 kilometers west of the capital town; 10-20 meters offshore is ideal for scuba diving. Its approach is via the base of Barangay Tagdo in Mambajao. It is a volcano 1250 meters high above sea level. Its slopes are challenges/barriers for professional climbers as they trek skillfully and maneuvers on loose rocks and boulders towards the peak. At the zenith, there is a crater like lake and steam outlets where one can have a clear panoramic view of the entire island and the Bohol Province during sunny clear days. A volcano located 13 kilometers away from Mambajao with stiff drop off measuring 7,080 meters high above sea level. It is the landmark for PANAAD. 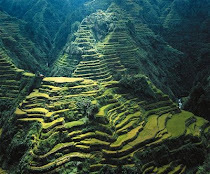 It is located at Butay, Guinsiliban and a 3-hour climb uphill. There, one can see bluish green ridge of mountains and majestic slopes as he recites his Stations of the Cross, especially on Lenten Season. One can experience a sense of relief when reaching the top with its cool mountain breeze. Its splendid beauty is very touching. At the pinnacle, climbers can peacefully camp and take pleasure in unbothered world. An isolated white sandbar where the view of towering Mt. Hibok-Hibok and Old Volcan reflects the sumptuousness the Province of Camiguin has ever achieved. It is reached within 10 minutes through light water transport from anywhere in Yumbing, Mambajao area. The island is 4 hectares of evergreen forest, fringed with white granule sand beaches. A fishing village is found in the north of the island. One side of the island is a white sand beach with coral offshore, and the other opposite side provides a deep drop-off for snorkeling and diving. One gets there by light water craft in 25-30 minutes from San Roque, Mahinog. It lies approximately 2 nautical miles from the shore of Balbagon, Mambajao. The seabed rises forming a shoal about 10 hectares in size hosting a variety of aquatic life. It is one of the best dive spots in Camiguin Island teeming with fishes of different species and shapes/sizes. It has excellent visibility and is best for underwater photographs, and novice divers. Slightly smaller than Jicdup, Burias is among the favorite spot for high adventure seeking divers. It hauls the thrill seeking divers to the shoal to see schools of jacks, tuna, mackerels and barracudas. A verdant black coral covered bottom is also one of its treasures. Diving here can be strong, however, the little effort spent fining against the current is worth the excitement. It is a lagoon mantled by limpid water, located at Benoni, Mahinog, with large cliff and gently rolling hills. The brackish water is engulfed in there by a century old crater, ideal for boat and fishing. A Pili Nut tree which is more than century old situated at Lakas, Mambajao owned by the Corrales Family. One can marvel how the tree survived the tests of the times as he sees and touches its huge trunk. CAMIGUIN celebrates year-round festivals like Lanzones Festival held every third week of October when sweet Camiguin lazones is proudly displayed. Highlights of the festival include agri-trade fair and street dancing contest that feature traditional dance, drum circles and colorful ethnic costumes; San Juan sa Hibok-Hibok Festival held every 24th of June in honor of St. John the Baptist with fluvial processions, parades and water sports; Panaad - Holy Week observance when tens of thousands of Christians come to the island to walk around the 64 kilometer circumferential highway as a form of sacrifice, either to fulfill a vow or to do penance for the remission of sins. The pilgrims congregate either at the Old Vulcan or Mt. Ilihan to pray; Camiguin Christmas Festival when choral competition, pastorales contest, parol sa barangay and belen sa barangay are conducted during Yuletide Season; and May Festival when notable fiesta celebrations of almost all barangays in Camiguin re-celebrated. To get to CAMIGUIN, one has to travel one and a half hours from Cagayan de Oro City to Balingoan, Misamis Oriental, and take any of the hourly scheduled ferries across the channels of Mindanao Sea, which dock in either ports of Guinsiliban or Benoni. There is a regular sea and air transportation from Cebu to CAMIGUIN and vice versa. Once in CAMIGUIN, one can go around the 64-kilometer circumferential road in just one hour and a half time through public or private transportation. The people of CAMIGUIN are friendly, fun-loving, and very hospitable. It’s capital, Mambajao, has a friendly small community of mostly Visayan and Chinese origin. Camiguingnons are also hardworking. The main occupation of the people is fishing and farming. Coconut is the major production as far as sources of income is concerned. Other plantations are abaca, rice, mangoes, lanzones and other fruit trees. Small cottage industries are increasing in number to accommodate the influx of visitors. Cebuano is the main language while a few speak Kinamiguin, an ancient dialect. Nearly everyone speaks English fairly. Their source of livelihood comes from the produce of their land and the surrounding ocean. Every October, Lanzones Festival transform the island into an explicit sight of townsfolk dressed up in their traditional costumes to celebrate the harvest of this small, sweet tasting, light-yellow fruit that grows in bunches at the foot of Mt. Hibok-hibok. The festival is remarkably good-natured, filled with colors and properly organized. Camiguin Lanzones Fruit Aside from these natural landforms huddling in the island, Camiguin is an area of forested mountains mixed with coconut trees along its coasts. CAMIGUIN beckons you to come, savor and discover the many ways anyone can unwind and joyfully dwell on the island's offerings.